Buffalo Chicken Meatballs are perfect for football season! Made with minced celery and carrots hidden inside, topped with hot sauce, and homemade blue cheese dressing – yum! You can put buffalo sauce on anything and it will taste great! Some favorite buffalo chicken dishes are Buffalo Chicken Strips, Buffalo Chicken Jalapeno Poppers and Buffalo Chicken Lettuce Wraps. Since these are appetizers I calculated the N.I. per meatball but by all means, eat more than one! 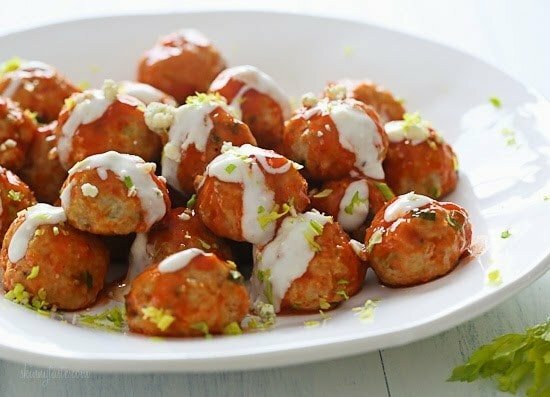 How do you make buffalo chicken meatballs? 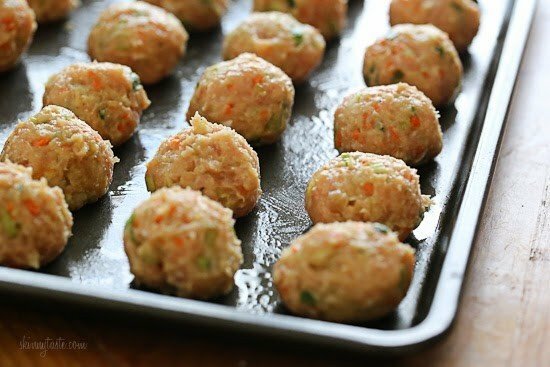 Ground chicken is mixed with chopped celery, carrots, scallions and panko, then rolled into balls and baked in the oven. Once they are ready you toss them with hot sauce, and drizzle them with blue cheese dressing. Perfect for football season! 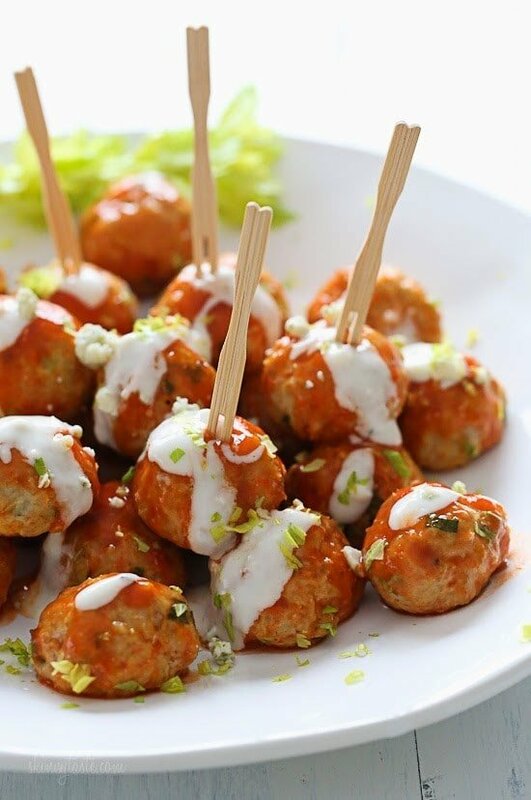 Baked chicken meatballs with minced celery and carrots hidden inside, topped with hot sauce, and homemade blue cheese dressing – yum! Lightly spray a non-stick baking sheet with oil. 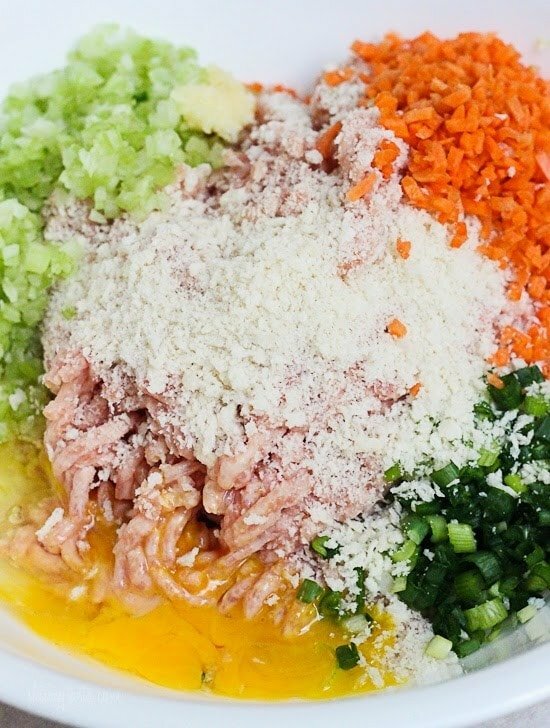 In a large bowl, combine the ground chicken, panko crumbs, egg, scallions, celery, carrot and garlic; season with salt and pepper, to taste. Using clean hands, mix until combined. Roll the mixture (1/8 cup each) into 26 round meatballs. Place meatballs onto prepared baking sheet and bake until cooked through and golden, about 16 to 18 minutes. 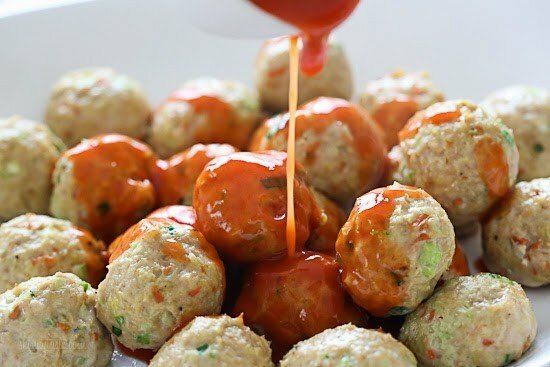 Place the meatballs in a bowl, add the buffalo sauce and gently toss to combine. These are soooooo good! !We forgot the carrots, but who needs carrots anyhow! :o)Making a double batch this time. 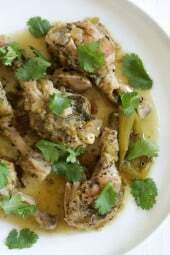 Can these been done in the slow cooker? If so, any recommendations for time? Can you make these into sliders or burgers? Hi Gina — these look yummy! Could I make these in my Instant Pot if I used a method similar to the Salisbury Steak Meatballs? Thanks for the recipe! I made last night and they were Delicious! Also just finished off the leftovers for lunch right now. Will be making a double batch next time!!! 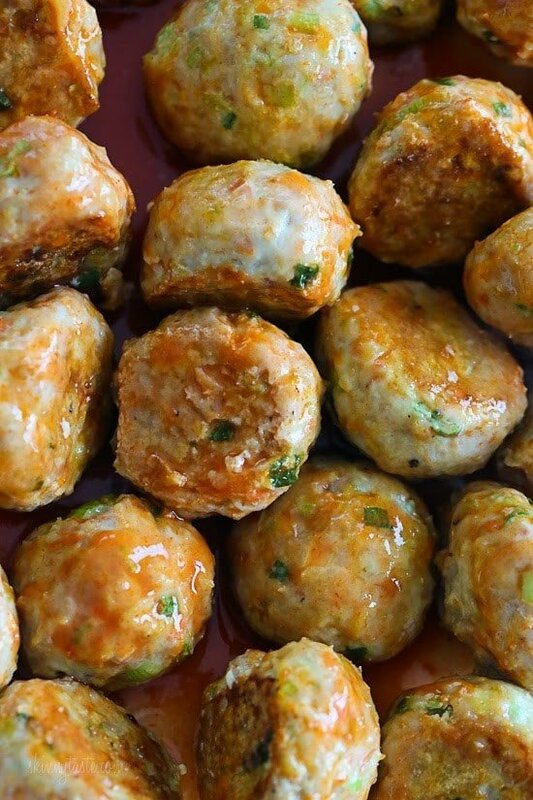 I’ve tried a lot of recipes for Buffalo Chicken Meatballs, but this one is the BEST! Question – is this with ground chicken breast? Curious because we sometimes grind our own chicken breast but I think the packages ground chicken has more fat. 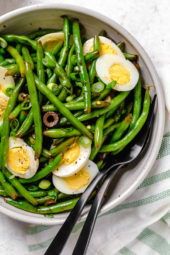 Any suggestions for converting this to an instant pot recipe? Thanks! I made these last night. Mine came out extremely wet. I mean to the point I could not roll them. Still very tasty. I followed the recipe to a T. What could have happened? Mine too. They were blobs instead of balls. If you use ground chicken breast, does that change the points ? I’m sorry, still new and trying to figure out point system. I understand Panko has points but when it’s spread out in a recipe how do you figure out the points ? Everything is 0 points but the Panko. These were so tasty and filling! I made them for my lunches and they were just delicous! I also didn’t feel stuffed. I didn’t have time to make your blue cheese dressing, so I bought a light version at the store. I took these to a holiday party with adults and kids and these were a big hit with everyone. I made the bleu cheese dressing and people loved it as well. Thanks for the wonderful recipe and letting me eat something without the guilt. Can I sub GF breadcrumbs. And would still taste yummy? Sure, GF crumbs will work. I just made these today and the are amazing! I wasn’t craving buffalo wings like no other! I think I prefer these over a battered piece of chicken. The carrots and celery add a perfect crunch. So good and easy peasy! I hate when people leave comments like I’m about to leave, because comments should be based on the exact recipe, not substitutions. But!…these were too amazing to not comment! I used lean ground turkey instead of chicken because that’s what I had on hand. I’m also doing a Whole 30 right now so I can’t have grains or dairy. I subbed almond flour (great sub for bread crumbs of any kind) for the panko and used a homemade ranch instead of blue cheese. Oh.My.Goodness!! They were amazing!! I brought them as an appetizer to a family get together to watch a football game and everyone LOVED them! A lot of “clean” appetizers are often odd and not what people really want when they think of party foods. But these were a hit!! Because of the previous comments, I made a double batch. Glad I did!! There were only a few left over. This recipe is definitely a keeper!! I was wondering how to make them keto friendly. Thanks for tip about almond flour! Hi! 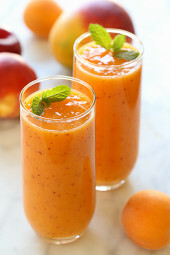 Can this be made a couple of hours in advance and served at room temperature or will that alter the taste/presentation? Made these tonight for football game apps!!! Amazing! The blue cheese dip was delicious and balanced the heat perfectly! Double the recipe, trust me, you’ll want extra. I made mine with turkey instead of chicken and they were just as delicious. Thanks Gina! thanks for posting. was concerned how ground turkey would taste since that’s all I could find at the store today. Made these balls last nite and they were a hot! Everyone was asking for the recipe. Super good!